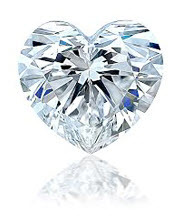 This heart shape diamond ring glimmers with beauty and elegance. Designed to meet your diamond jewelry needs. Its glow speaks nothing but sophistication. The center heart cut diamond of this ring gleams and sparkle. A beautiful display of a woman’s worth and character. They say that diamonds are forever and diamonds can ultimately be described as a girls’ best friend. For women, receiving a diamond engagement ring during marriage proposal is like a fairytale. When a woman pictures of engagement proposals, it always depicts of having a diamond engagement ring. It is the most romantic gesture of a perfect gentleman. It is a perfect gift that will last a lifetime. A romantic way of asking her to say yes.